If you’re looking for an LED light bulb to replace an old incandescent bulb, look no further than this 15 watt LED bulb from Philips. Equivalent to 75 watt standard incandescent light bulbs, this bulb is a great way to save a little money on energy bills. In fact, for each 75 watt incandescent bulb you replace with one of these Philips LED light bulbs, you’ll save up to $63 a year. With its very long bulb life, you can expect to save even more. This light bulb is rated to still produce 70 percent as much light after 25,000 hours of operation (more than 1,000 days of continuous use!) as it did when it was brand new. That means you would have replaced approximately 16 incandescent bulbs before you’d need to replace this LED bulb. This bulb is an instant-on LED light bulb, meaning you won’t have to hassle with any of the inconvenience of waiting for your light bulb to warm up. Additionally, the entire line of Philips EnduroPro lamps contains no lead or mercury, making for an easy and environmentally safe disposal process. To make this bulb even more attractive, Philips engineered it to be dimmable, giving you a lot more flexibility than a traditional bulb. These replacement LED bulbs are great for almost any application: areas where you might need energy efficient lighting, hard to reach spots, places where bulbs are on for an extended period of time, damp locations and more. 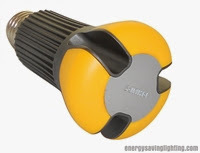 Have questions about this light bulb or any other bulbs we offer? Leave us a comment and we’ll help you find an answer!